Have you ever wondered how well your website is performing? Unless you are a website guru, you probably haven’t paid much attention to what is happening behind the scenes: Is it configured properly? Is it fast enough? How usable is the site? Do I have the right keywords? Does it work with mobile devices? Are you missing Robots and Sitemaps (or have no idea what those are?)? 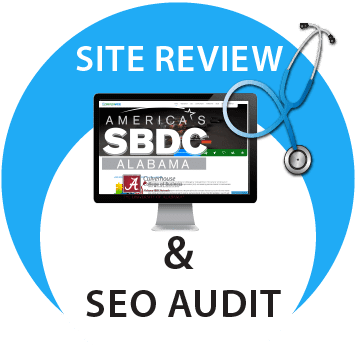 The Alabama SBDC Network can provide you with a free website analysis, with suggestions on improvements that can be made. Some improvements will be easy, while others may require a conversation with your web developer or hosting company. The report that you receive will be 15 to 25 pages of analysis, plus suggestions on how you can improve. We’ve included links to other websites that explain some of the key concepts in depth. Want to see an example? We reviewed the Alabama Department of Commerce’s website, MadeInAlabama.com, which was only recently launched. It scored well, but can still be tweaked. Please note that not all of the portions of our review will necessarily apply to your website. A manufacturer of industrial hydraulic presses may not benefit from having a Facebook page, while the local frozen yogurt shop may find it to be vital.